This year's Computex trade show in Taiwan has seen some pretty weird and wonderful technological delights, but none of them have quite the sheer power of the new OrionX machine. A £16,000+ liquid-cooled gaming PC that's so mighty it might be the most powerful PC money can buy. 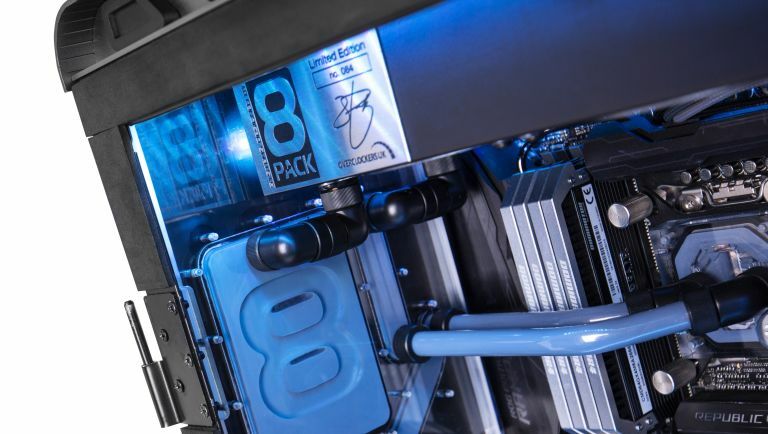 It's been created by Overclockers UK in partnership with its own internal extreme system builder 8Pack and acrylic fabrication company Parvum Systems and offers some of the most impressive (and expensive) gaming chops on the market. Interestingly, it's technically not one PC but two of them working together to give you the smoothest, most robust system your well-earned funds could buy. The first is packing three (THREE!) Nvidia GTX 980 Ti graphics cards and Intel Broadwell-E 6950X featuring 10 cores and 20 threads (yes 10 actual cores and 20 actual threads) meaning you're new machine can handle any graphical gaming monster on the horizon (including The Witcher 3 Wild Hunt on top specs). To ensure all that rendering and graphical output works smoothly, the first PC setup uses a meaty Asus Rampage 5 X99 motherboard. The second PC is sporting a Asus Maximus VIII Impact motherboard and Intel Core i7-6700K, which has been overclocked to an astonishing 4,8GHz. The idea here is you can have your OrionX chugging away rendering YouTube videos etc while you check emails or watch footage on Twitch. It's even got three different cooling systems to keep it from bursting into glorious flames. No news on an exact price and a release date yet, but we'll keep you updated when we hear something here at T3 Towers. Why not check out: Asus has a new robot companion that's ready to join your family - Zenbo!